Searing tomatoes boosts their sweetness and flavor and is key to this piquant sauce from Spain. 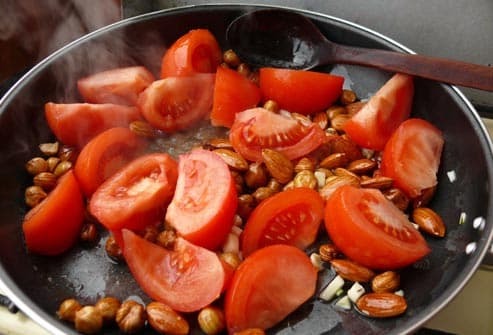 Pan sauté or slow roast several tomatoes in an oven with a whole head of garlic. Toss them in a blender with almonds, olive oil, and a splash of balsamic vinegar, and you've got Romesco sauce, a Catalonian classic. Halve tomatoes, brush the cut side with olive oil, and grill them -- cut side down -- until they've softened and charred. The heat intensifies the tomato flavor, and also boosts its antioxidant power by changing lycopene, a micronutrient, into a form that's easier for your body to use. 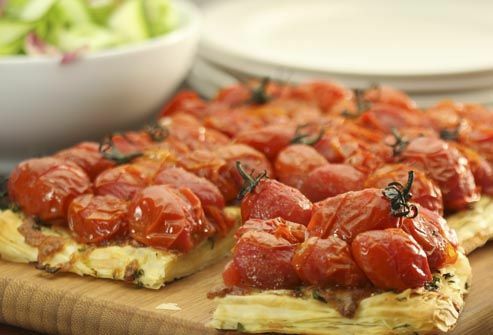 Unroll a sheet of puff pastry, brush with olive oil, sprinkle lightly with Parmesan cheese, and layer on plenty of grape tomatoes or slices in concentric circles. Bake for 20 minutes at 400° F. Heirloom tomatoes in different colors can be pretty. Add a green salad for a colorful lunch packed with fresh veggies. Berbere, a traditional Ethiopian seasoning mix of chili, garlic, fenugreek, and several other spices, makes this vegetarian dish super-flavorful and aromatic. Tomatoes and carrots add sweet flavor notes -- and provide vitamins A and C. Lentils are a rich source of iron, fiber, and protein. Easy to prepare in about 45 minutes, Ethiopian tomato-lentil stew is also low in fat and calories. Choose the most flavorful, juicy tomatoes you can find for this chilled soup. 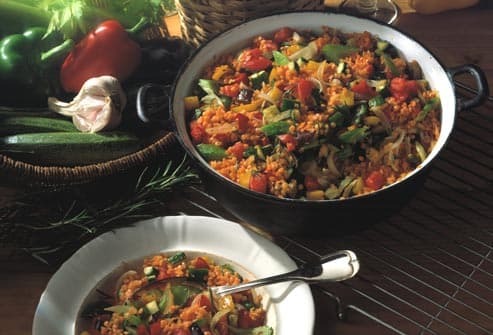 Use a 3:1 ratio of tomatoes to other ingredients such as bell peppers, onions, and cucumbers. 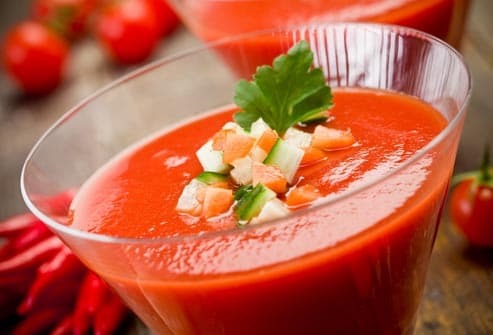 For a sweet twist, try watermelon-tomato gazpacho. Both of these bright red fruits are full of the antioxidant lycopene. 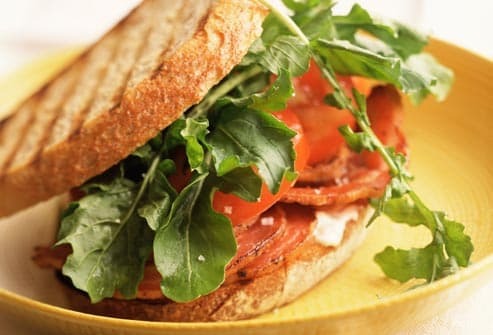 Stack whole wheat bread with thick slices of tomato, tasty greens like arugula, and two slices of thick-cut, uncured bacon. Go easy on the mayo -- use less than a tablespoon -- and your sandwich weighs in at fewer than 500 calories. Skip one slice of bacon if you'd like to shave about 100 calories from this tomato-lover's classic. 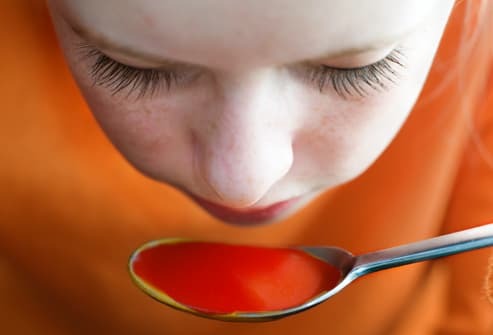 Making your own tomato soup is simple. Simmer onions and tomatoes -- canned are fine. Add flour and milk for a creamy taste without the calories and fat of cream. 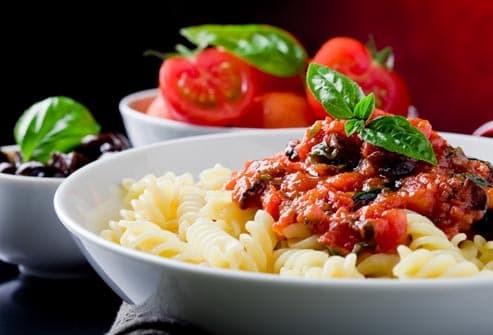 Toss in a pinch of baking soda to cut the tomatoes' acidity, then puree everything. 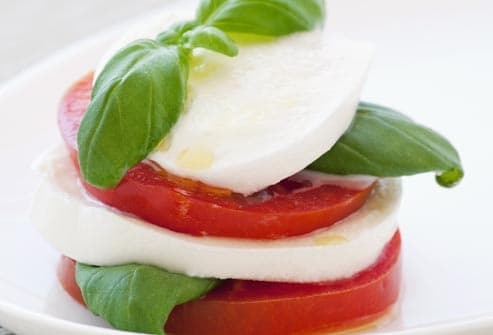 Fresh tomatoes, fresh mozzarella, leafy basil, and olive oil are all you need to whip up this summer salad. 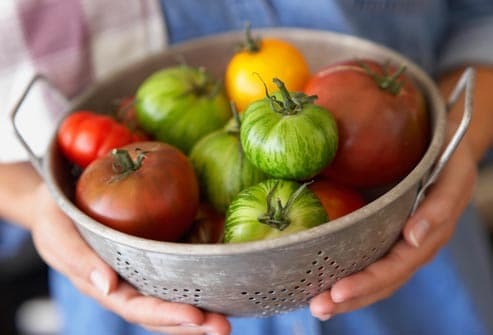 Heirloom tomatoes in golden-yellow or dark green stripes will add extra color interest. For an appetizer version, skewer a cherry tomato, a mini-ball of fresh mozzarella (called bocconcini) and a basil leaf; then finish each skewer with an olive oil drizzle. Cook green or red tomatoes with onions, brown sugar, ginger, and vinegar until the mixture is thick and shiny. It's a perfect accompaniment to Indian food. 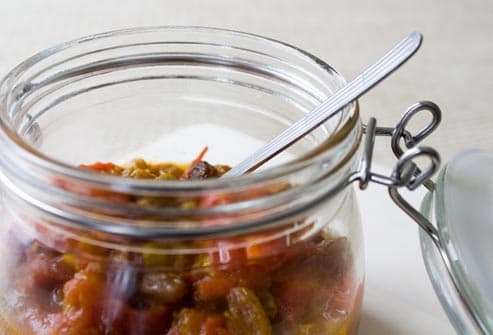 Or liven up an ordinary cheese plate by adding a small dish of this savory and sweet chutney. Provide a spoon so guests can ladle it onto a cracker or crostini -- a thin, toasted slice of French bread. Making your own tomato sauce is easy, and healthier and less expensive than buying it. Keep ingredients simple: sauté tomatoes, garlic, and onions. Add herbs, spices, salt, and pepper to taste. Use fresh tomatoes in season and canned for more flavor at other times of the year. During the tomato season, the tastiest fruit may come from your local farmers' market. 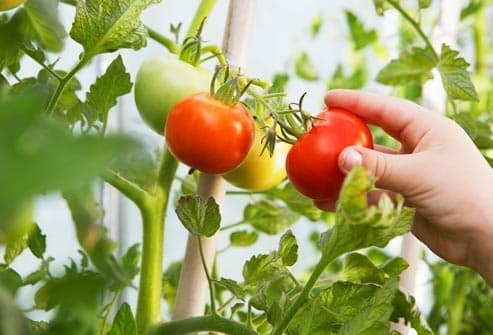 The greenhouse tomatoes sold in grocery stores come in many varieties, including "on the vine," and are available year-round. Do a taste test to find your favorites. Can't find a perfectly ripe one? 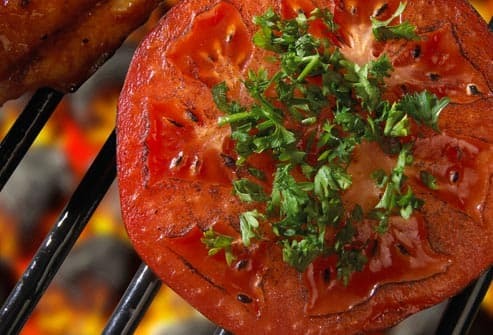 Roast, grill, or sauté a tomato to deepen the flavor. Those funny-shaped, weirdly colored varieties are heirloom tomatoes, grown from seeds passed down for generations and prized for distinctive flavors. "Mortgage Lifter" is one large, beefsteak type with a spicy, less acidic flavor. "Green Zebra" is golf-ball size. It's both sweet and tart in flavor, with a hint of citrus. Find heirloom tomatoes at the farmers' market, or try growing your own. 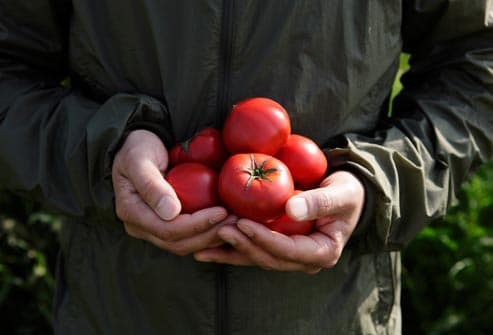 You don't need lots of land, or even a yard, to grow your own tomatoes. Just a sunny spot and a container filled with potting mix -- a 5-gallon pail is perfect for a single plant. If you're short on space, look for bush or cherry tomato types. They may do better in containers. Jennifer Hill, BSc, RD, recipe developer, consultant, Foodess.com. Carolyn Brown, MS, RD, nutritionist, Foodtrainers. Katie McCammon, MS, RD, LD, dietitian, QuarterLine, Fayetteville, NC. Agarwal, S. Canadian Medical Association Journal, Sept. 19, 2000. U.S. Department of Agriculture National Agriculture Library.